In any material, the increase in density with decreasing volume is directly related to the nature of the interatomic interactions. For typical crystalline materials, the volume varies as the cube of the change in interatomic distance. In amorphous materials, however, an irregular network of interatomic interactions can lead to deviations from this well-established relationship. 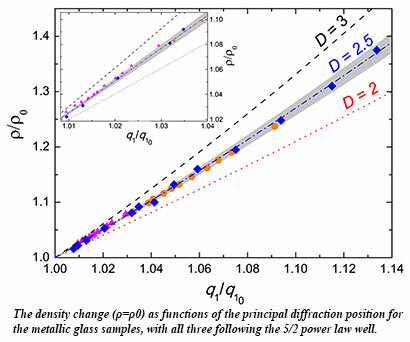 For bulk metallic glasses (BMGs), a 2.3 (as opposed to the expected 3) power law relationship has been proposed based on studies of materials with different compositions, but at high pressure, the problem of accurate measurement of density and volume in the diamond anvil cell has made such studies difficult. In recent work, scientists from Carnegie and Stanford have used a unique combination of x-ray diffraction, ultrasonic interferometry/x-ray radiography and transmission x-ray microscopy to determine the density and volume of BMGs at high pressure. Studies of several different compositions from 0.7 up to 22 GPa show that a 5/2 power law relationship describes the compression behavior of BMGs quite closely, suggesting a universal type of behavior for these and perhaps other, related materials. [Zeng et al., Phys. Rev. Lett. 112, 185502, (2014)].